Sorry for the late post today. I meant to have this up bright and early but didn't get a chance - I fell asleep on the couch last night before I had a chance to write it up! Today's card features the super cute Winter Evergreen Tree image from DeNami Design. It's perfect for the Christmas season, don't you think? I decided to go non-traditional with my card and use pinks and greens - thinking outside of the box, right? :) But you all know it's my very favorite card color combination so I couldn't NOT use these colors. For my card I used the striped paper from the Watermelon Sampler Pack and paired it with a cardstock base of Leaf Green (another favorite!). For fun I added some 3/8" Hot Pink Grosgrain Ribbon and topped it off with some Bubblegum Boutique Buttons. It was one of my last cards I ever got to create before my things got back away in boxes! This might be my last crafty post for the rest of the year since everything is so uncertain right now. I want to take this moment to thank Nami, Paulina and the rest of the DeNami Design Team for such a fabulous 8 months! I really enjoyed working with such a wonderful and talented group of ladies. Their creativity inspires me everyday! THANK YOU SO MUCH! Thanks so much for visiting today! Hope you're having a wonderful Holiday Season! Today I have another fabulous DeNami card featuring the beautiful Elegant Floral Arch stamp. For my card I flipped the Arch and colored it with my SU! markers. I masked off the Congratulations Circle stamp and stamped it on top - almost like creating a basket. I used my favorite colors - Magenta and Lime and my favorite Bella Press paper sampler: Watermelon. I then finished off the card with DeNami's pretty Pink Grosgrain Ribbon. Hope you all are having a fabulous month so far! I can't believe it's already Thanksgiving NEXT WEEK! Ack! And we'll be spending Thanksgiving in our new home! So exciting! I'm totally loving Fall colors right now... I guess it comes with the season. And I couldn't wait to use my new Solid Decorative Crest stamp! I've been seeing what the rest of the DeNami DT gals hae been doing with this beautiful stamp and couldn't wait to give it a try! I also thought I would use the super simple, but oh-so-cute, Decorative Love stamp. I thought it would be great to add a little fun stamp to something so elegant. I finished it off with my favorite DeNami polka dot ribbon and voila! Here's my card for my very own challenge. Today the DeNami DT is challenging you to create a CHRISTMAS card! Fun, right? For my card I used the new and super cute Christmas Tweety Birds stamp along with the Season's Tweetings sentiment. I also used DeNami's Leaf Green cardstock and added some 3/8" Red Grosgrain ribbon. I really love creating holiday cards. They're great to have on hand when you're in a pinch to give a little gift card and don't know how to package it! And in creating this card, it just reminds me that I better start my Christmas shopping! Ack! Have you started your shopping yet??? Anyway, thanks for visiting today! I hope you're having a great week! It's another DeNami Product Challenge Day! This time, the challenge is to use the adorble Cornstalks stamp! I stamped the Cornstalks image 3 times before coloring them with my Copics. It thought it was perfect for creating a super cute background! I also used the adorable Scarecrow image and Assorted Greetings "Thank You" sentiment Petit Fours set! I was also feeling a little sassy so I stamped up my Square Word Bubble too. I absolutely love how it's so perfect for my Petit Fours sentiment stamps! The 5th of the month brings us another DeNami Product Challenge! This time it's all about RIBBON! Did you know that DeNami carries a whole array of some fabulous ribbon, ranging from sheer, grosgrain, sparkly... and in different widths, too??? So perfect for all of your crafting needs! I have been seeing these adorable rosettes all over the internet and You Tube recently and I've always wanted to give it a try - the 5/8" Orange Grosgrain ribbon was PERFECT! If you would like to see a tutorial on how I created this, let me know! Otherwise, you could probably do a search on You Tube and find one too. It was definitely EASY PEASY. For the rest of my card, I used Kraft and Leaf CS and the Teeny Swiss Dot and the Let's Get Together sentiment. I thought this card would be cute to give to girlfriends for a fun girls night out! Hope you join us in this week's challenge! Don't forget, there are prizes to be won! Have a fabulous week and be sure to check out the rest of the DeNami DT for more inspiration on how to creatively use RIBBON! I love how simple this sketch is... It was really fun to work with! For my card today, I wanted to create a bridal shower card to keep on hand. You never know when the need might arise when you need one of *those* kind of cards that you just don't have to make! I used the super pretty Mimi Bride stamp and colored her with my Copics. I shadowed her dress with just a little bit of AtYou Clear Spica pen to give it a little shimmer. Thanks for visiting today! Hope you have a fabulous week! 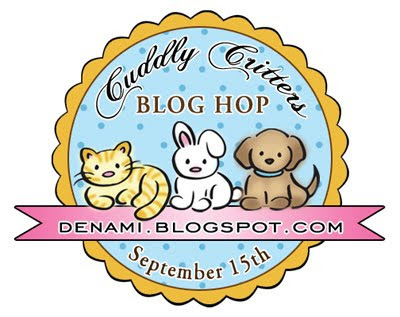 DeNami Cuddly Critters Blog Hop! Hi everyone! Welcome to my stop on the DeNami Cuddly Critters Blog Hop! My card is kept super simple... I used DeNami White and Magenta cardstock for my base and stamped the adorable Hula Chickie 3 times and colored her with my SU! Stampin' Write Markers and Copics. To complete the card I stamped the Aloha sentiment in Shabby Shutters Distress ink. Totally simple but totally my style! Thank you SO MUCH for visiting today! I hope you enjoyed my card! Be sure to complete the hop and comment on every participant! We are giving away THREE $20 gift certificates to our website! We'll be giving away one gift certificate to a random participant (DT members not eligible) and then we'll also be giving away TWO gift certificates to TWO people who comment along the hop! Your next stop on the hop is my fellow DeNami DT gal and awesome friend LAURIE CHILTON! DeNami Product Spotlight: Halloween Petit Fours! It's time for another DeNami Product Spotlight! This time we're showcasing the Halloween Petit Fours set. You all KNOW how much I love these super cute and adorable sets - I can't say it enough! This time I used the adorable spiderweb from the set and stamped it inside the Small Stitched Circle - it's a new stamp I've added to my ever-growing DeNami collection and I just love how versatile it is. I've seen what the rest of the DT gals have done with it and I couldn't wait to try it out for myself! LOVE! I also used the Square Word Bubble and stamped the Boo! sentiment from the Halloween petit fours set inside it. I thought it would be the perfect compliment the adorable Trick or Treat Chickies. Adorable, right? For the rest of my card I used DeNami cardstock in White, Leaf Green and Amethyst. Love these colors accented with orange grosgrain ribbon - so perfect for Halloween! One of my favorite times of the year to make fun cards! White, Pink and Black are such a fun color combination - it's one of my favorites! Here's my card! Super super simple card today. I wanted to make sure that the colors were the stars and the adorable Heart Flower Trio Circle - one of my faves! :) I also used some scrap fuscia CS and some White CS. The DP is from Making Memories.